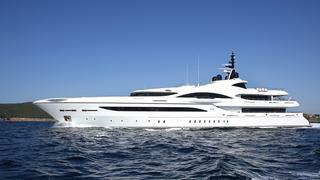 It is fair to say that, by any measure, the 72 metre yacht Vicky is unique. On first reading, this may seem like a redundant statement - she is, after all, the epitome of a large custom project. But take a look into her back story and one thing becomes clear, this individuality is borne not so much through initial intent, but rather through the vision of her owner, ably interpreted by her design, project, technical and yard teams. Started by the yard as a sister to Talisman C, the end result could hardly be more different. They were built at the same facilities in Tuzla, near Istanbul, they share the same engines, steel hull and part of their layouts, but that is all. The aluminium superstructures, the weight, the volumes and the overall appearance differ considerably. 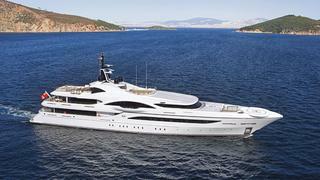 Even the dimensions vary by two metres (70.54 versus 72.6) and this difference makes Vicky the largest Turkish-branded yacht launched to date. Vicky certainly has that wow factor - but without shouting too much. 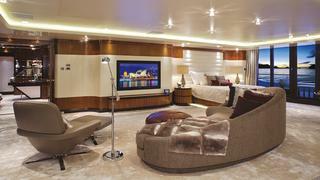 She reveals more and more detail to guests as they spend time on board and absorb the eclectic finishes of the interior. The impression is relaxed, comfortable and residential, with plenty of light. This is the result of a mix of classic wall treatments and carpentry details with contemporary European furniture. 'The layout boasts four distinctive features. The first is simply the variety of styles used. The owner wanted us to change the style according to the spaces rather than repeating the same features over and over again,' says Horsfield. The four guest cabins on the main deck are equal in size, but the variety of styles means that each begs to be explored. The third characteristic, unusual on a yacht of this length, is the spa on the lower deck, almost at sea level, with a hinge-down platform located to starboard. 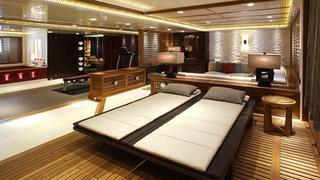 To port is a steam room, a shower, a spa pool, heads and a treatment room, while an area for yoga is in the centre. To give this area over to a spa was a bold decision. The style is unashamedly Asian as Horsfield puts it, with teak and limestone giving a warm and tranquil atmosphere. The fourth distinctive feature is at the very heart of Vicky. 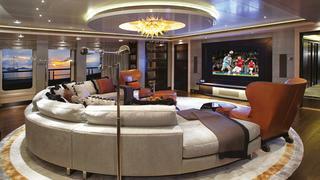 The full-beam owner's suite is located amidships behind the bridge. With balconies to port and to starboard it offers a stunning vista, as well as total privacy, since the balconies can be reached only from the suite itself. Its location required careful planning for crew access, notes Horsfield. 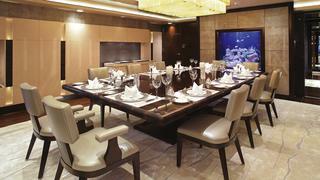 The style is rich and quite classic, with walnut and leather panelling, while the furniture is modern and eclectic. Captain Simpson, and technical consultant J O'Sullivan, prove expert guides to the lower and bilge decks. O'Sullivan is an experienced technical consultant on marine engineering and naval architectural matters; he handles warranty issues up to the twelfth month after delivery and hasn't missed a stage of the yacht's life since becoming involved. Before leaving a dark and rainy Tuzla at the end of a long winter's day, we pay a final visit to the Proteksan-Turquoise office. Here we have the chance to thoroughly compare the layouts of Vicky and Talisman C. With the help of Bediz Dosemeciler, a naval architect and engineer from the yard, the differences between the two yachts are revealed in a spot the difference game. Vicky's foredeck has a shell roof, Talisman C's is open; Vicky has four generators rather than three; Vicky has a lift, and a helipad; and moreover_ Vicky_ has that sporty, exterior line. With Vicky, Proteksan has again proven its ability to innovate and be flexible. They call them sister-ships, of course, but only for convenience. With an interior that invites and excites, an innovative layout, and key design features that deliver the requested wow factor and then some, Vicky is a triumph of a yard's ability and an owner's vision.